Supercharge your marketing, sales growth and retention programs with Pardot Marketing Automation. We are experts in Marketing Automation Strategy, Implementation, training and execution. Marketing Automation when executed well allows your customers to engage with you when they are ready, receive personalised communications tailored to their needs. Great Marketing automation flows down into your sales cycle ensuring leads are nurtured and handed to sales at the right time. It can free sales people to spend more time selling to the right people at the right time. Discover the different Pardot implementation options. Companies that automate their lead management see a 10% increase in revenue within 6 – 9 months and further savings through less marketing waste and savings of up to 80% on direct mail budgets through event triggered marketing. We can tailor Marketing Automation services to meet your needs. These range from full strategy development service to one on one training for new starters. The following are just a guide. Let us know what you are after and we can put together a program to suit your needs. To get the most out of your marketing automation technology it is crucial that you have a solid strategy that integrates both marketing and sales and the journey you want your customers to go on. Our strategy sessions can focus on Marketing Automation and its integration into your existing programs or can take a more holistic approach and work with you and your team to review or design your marketing activity from the ground up. 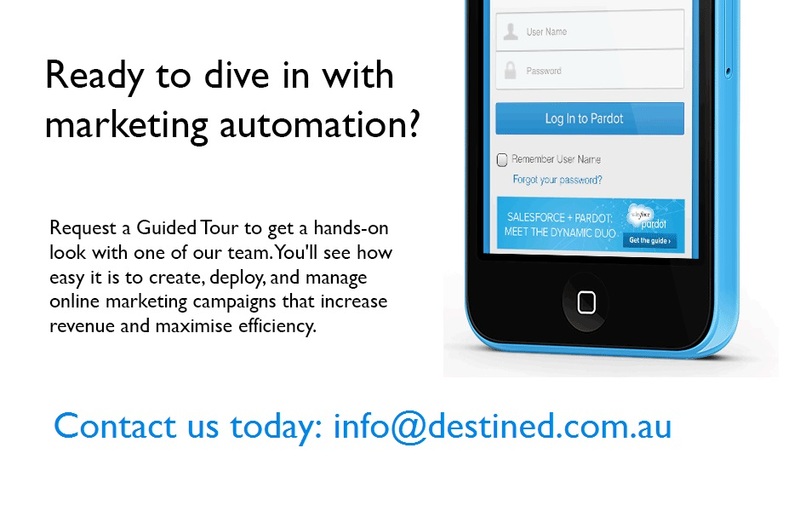 For some organisations we run their Pardot Marketing Automation system for them. We look after everything from setting the system up in the first place and ensuring in compliments their strategy all the way through to building content, campaigns, nurturing leads and handing them over to sales. We report on activity and results. We are a Pardot Preferred Partner and the first in Australia. We have worked across many different industry sectors. While we acknowledge that your business is different, may of the things we have learned can be applied. We approach Marketing Automation from a strategic starting point. Get your strategy right, and then let the technology enable it (not the other way around). Destined were able to jump on board and support us with short notice (literally a few days) through the implementation process of Pardot transitioning from another system we’ve been using for years. Without their support and commitment, we would have struggled to achieve this transition within time and it definitely avoided a lot of stress and heart-ache. I would recommend Destined by Design to any business going through such a similar transition in their operating systems. Thanks Guys! Taking the time to stop and think about our overall strategy and how automation fits into it with the help of Destined has been invaluable. It has given us the framework to then implement the kind of customer journey that matches our brand aspiration, leveraging Pardot to achieve this.